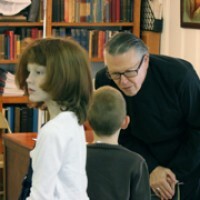 St. Hilda of Whitby Anglican Catholic Church - Your Spiritual Home - Sunday School ??? It has come to our attention once again that having a Sunday School for the little ones would help us to provide a more meaningful experience for both parents and children alike during Mass. The children of both our parishioners and of our VISITORS would benefit greatly from having a place to go during Mass where they can participate in age appropriate learning activities while their parents attend Mass. If you as a parishioner or a visitor have any ideas, comments, or suggestions concerning Sunday School at St Hilda's, please pass them along to Father Hall at frhall@sthildasacc.org. Discussions are ongoing, but if there is an interest, we would love to get things started as soon as possible.